Hello ... Hello ... my old friends ... It's great to see you once again! 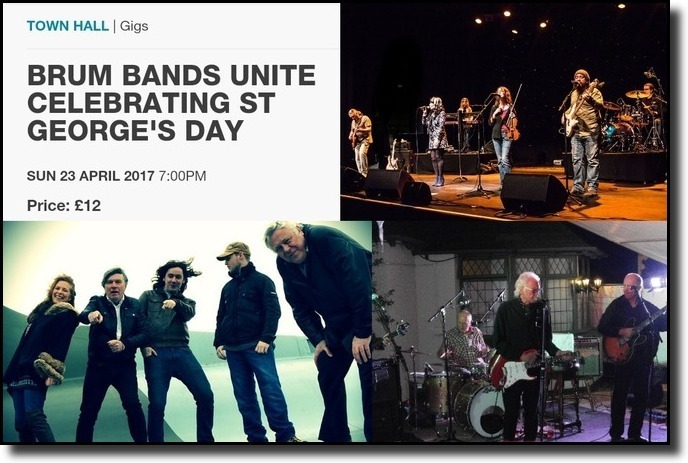 Brum Bands Unite is a St. George's Day celebration in support of the Justice For The 21 (J4T21) campaign headed up by Julie Hambleton. The evening commences at 7:00PM on Sunday 23rd April at the iconic Birmingham Town Hall with an attractive bill including elobf featured Brum artistes Morganisation (Dave Scott Morgan - who co-wrote the song "21 Today" with Phil Hatton in support of J4T21), Quill (Joy Strachan-Brain) and Steve Gibbons plus ViX & her MsChiefs (Fuzzbox) and Chris Tye. All monies raised will again benefit Acorns Children's Hospice. elobeatlesforever (elobf) recommends Brum Bands Unite to those enlightened folks who enjoy the music of ELO, Jeff Lynne, Roy Wood, The Move, The Idle Race, 'Brum Beat', The Beatles and related artistes. See ya there?